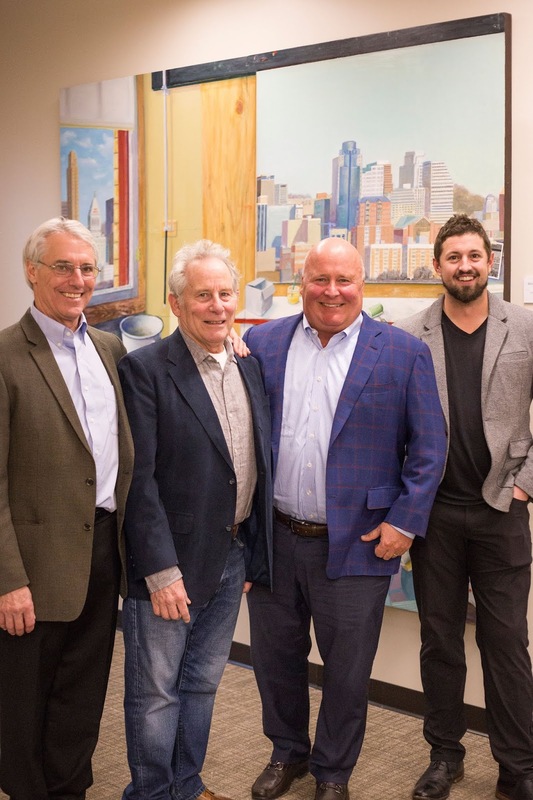 For one artful evening, Alvin Roehr transformed The Roehr Agency into a unique art gallery. 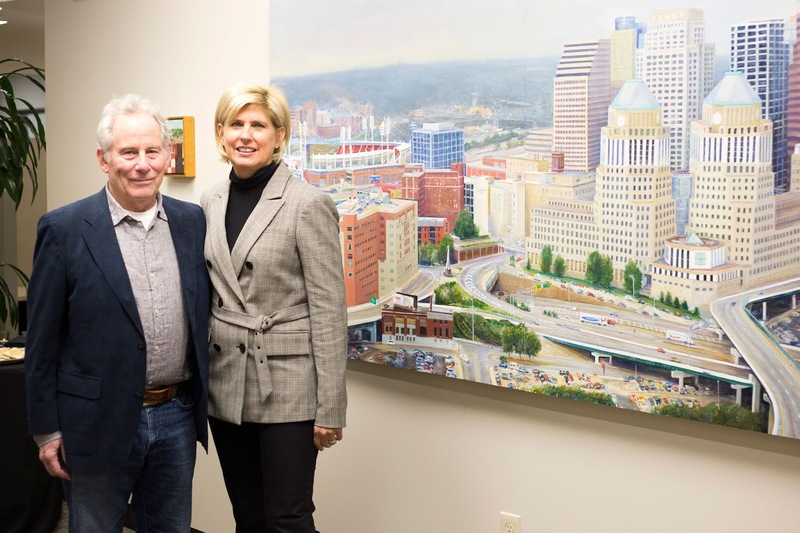 The walls were filled with the life story of renowned artist Cole Carothers, and the Agency’s halls were filled with people gazing at the breathtaking scenes that would make anyone proud of our city. 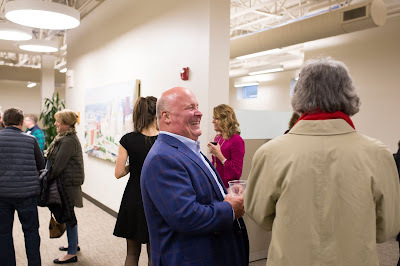 The event—“Cole Carothers: Cincinnati Time”—was a celebration of more than 40 years of Mr. Carothers’ work created while he was living in Cincinnati. It was a spectacular display of four decades of exceptional paintings borrowed from private collections, including new and unseen works. 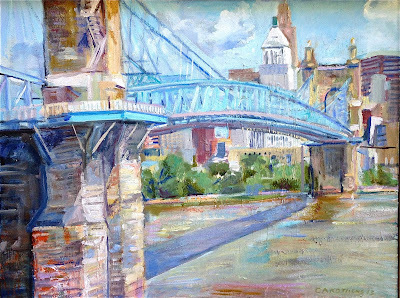 This exhibition—co-hosted by Oakley art gallery Caza Sikes—marked the first-ever retrospective show for Carothers. His large-scale Cincinnati masterpieces have never been displayed in the same place. 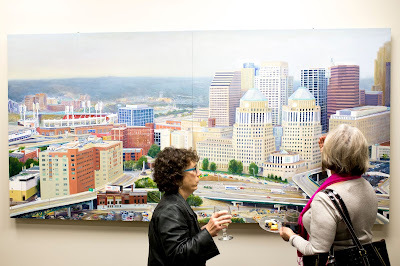 Consequently, the exhibit included many gorgeous borrowed paintings from the region accompanying the few remaining Cincinnati works for sale. Proceeds from the evening art sales benefitted Keep Cincinnati Beautiful, a non-profit dedicated to the beautification of Cincinnati. Alvin Roehr and the father-son owners of Caza Sikes, Reid and Evan Sikes—also announced their new partnership. 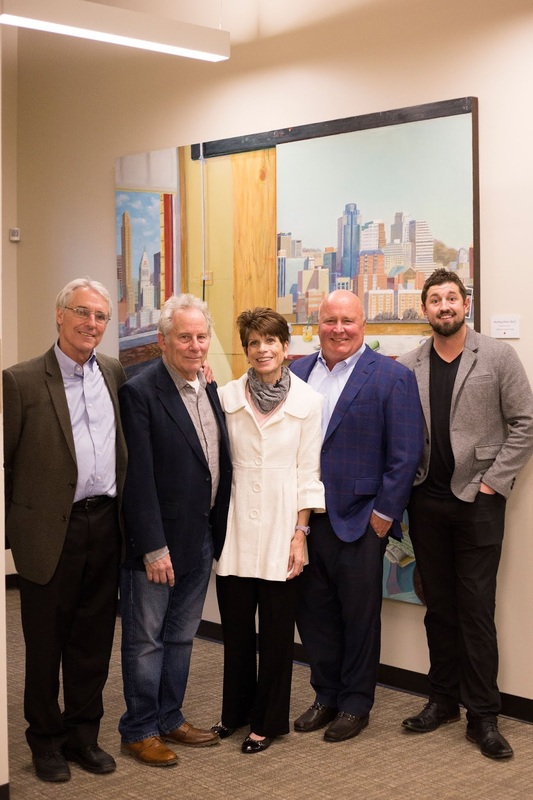 The business blend of the gallery—a nationally recognized appraisal specialist in fine art paintings, antiques, and other high value collectibles—and The Roehr Agency which is a full-service insurance agency truly benefits anyone who owns art work or something valuable. From 2011-2013 his paintings were hung in the Ohio Governor's executive offices in Columbus, Ohio. He also has a current installation in the U.S. Ambassador's office in Nairobi, Kenya. Carothers doesn’t run, but he admires the beauty, elegance and joy of every runner he sees! Renowned Cincinnati artist Cole Carothers and Joan Roehr with one of their Carothers favorite oil paintings in background. Opened in 2017, Caza Sikes is owned by father-son team, Reid and Evan Sikes. Both bring to the table a vast knowledge of art and history and a passion for customer service. Upon entering the beautiful and airy gallery space, you are immediately drawn to the space. Colorful images line the walls and floors, and there are many different styles on display. From handmade furniture - including elegantly contemporary wood pieces - to elaborately carved sculptures that seemingly jump out of the wall. Everything is artistically placed to capture your imagination and often your heart. Featuring both local artists and those from as far away as New Mexico and New England, this carefully curated gallery presents a wide array of fiber art, photography, glass, mixed media, ceramics, woodwork, sculpture, jewelry, paintings and more. Works are affordable and obtainable. The team of Evan Sikes, Reid Sikes, and Heather Sponaugle also offer full service personal property appraisal of antiques, fine and decorative arts, furniture, paintings and prints and other high end collectibles. Lending itself to the charm of the gallery is the space itself, home for over a century to Oakley Paint and Glass (now just down the road), the building retains industrial charm and is reclaimed as the home to the gallery and an event space for special events especially for charities. They say the best things in life are free. You can quietly walk around and enjoy your visual feast. It's free of charge. What could be better? You can get acquainted with artists and their work before they become famous or even while they're growing in popularity and price. By gallery hopping, you can call yourself a trend spotter or even a trendsetter. Nothing carries you away and clears your mind like visiting art galleries. It's like getting a quiet education. It’s meditative and fun. Art galleries often restore this great sense of calm and peace. Being around art and in the company of creative people makes you more creative. Don't get caught up on how, just enjoy your new found process. You may not buy anything, but when you visit a gallery or any retailer for that matter, you're setting into motion a chain of possibilities for them. Possibilities don't pay the bills, but they're better than no visitors at all. Word of mouth and the power of attraction should be taken seriously. A really good art gallery will have friendly, educated staffers on hand who can tell you all about the art that you're seeing in addition to some things about the artist. Art teaches us that we are part of something much larger than ourselves. You can see this quite clearly during gallery exhibition openings. There's nothing like being amid a crowd of people who love art. You may or may not find experts in the crowd, regardless; it'll feel great to be among a group of art lovers. Art is just plain fun. So are art galleries. You have the power to pick and choose the art that you like and want to spend time with. Enjoy.